This time (YES, THIS TIME), I am taking a deep deep breath, closing my eyes and hitting publish on this post. So, as of today, Tuesday, May 18, I am officially announcing our pregnancy. On the night of my birthday, five or six of us were sitting around (quite drunkenly) discussing our goals for the end of the year. Among them were get a job, be more social in a professional capacity, and (mine) get pregnant before the end of the year. Fast forward two weeks later... BAM. Pee stick. Two lines. DONE. GOAL. I believe I might be the first of that drunken conversation to achieve my goal. All I have to say is I WIN. I KNEW IT! I freaking knew it. No kidding. You've been on my mind ALL DAY LONG. Congratulations, Hills fam! Mucho love and many sticky baby prayers. I am so excited for you guys!! 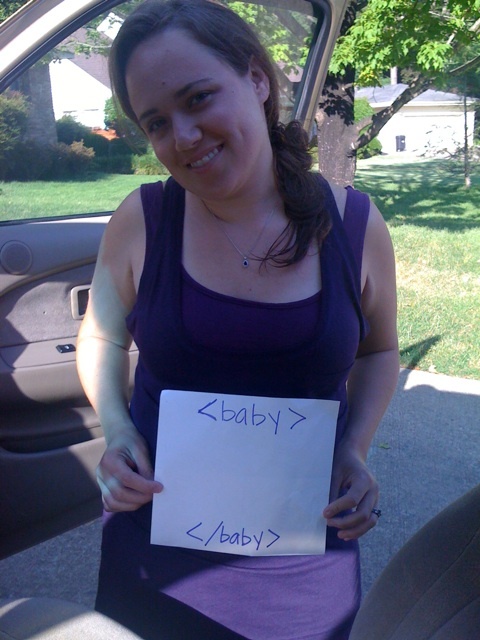 And Mike is terrified of babies, but he thought your html baby pic was awesome. Congratulations. I am so excited for you. I knew there would probably be another little one before long. Love seeing your little Nate's pictures and your ever so funny and interesting takes on life and motherhood. I'm so excited for you FOUR. Sending all kinds of positive baby thoughts across the pond! And lots of love too, of course. Congrats, this is awesome on so many different levels: Birthday/tipsy/goals/ff 2 weeks/baby =weeeeeee!! Congratulations, Kat! I had a feeling based upon some comments in previous posts that I'd be reading this news soon! Praying everything goes smoothly from here on out. How far along are you? So happy for your family! Hooorrraaaayyyy! Just one more nail in the coffin that is the baby bug that is trying to bite me. That made no sense. Whatever, you're having a bay-bee! whew...i kept a secret for what? 72 hours? i am so happy happy happy for all the hill's!!! I am proud of you for sharing with the world! I had the thought that you might be but didn't want to come right out and ask. CONGRATS! Very excited for you all. I am SO excited for you guys!!!!!!!! And super pumped about the due date. Also very proud of you for putting it out there! We totally would have been on to you this time. You kids were TOO good at the deceit! Love you ALL!! Hooray!!! I am glad that you shared. It can't be easy trying to keep such wonderful news to yourself! WHAT?! Oh my goodness. This is awesome. Thank you for not lying/consuming fake drinks/hiding out.... good news is meant to be shared. CONGRATS! xoxo. congratulations! That is so exciting and I am so happy for you. Duuuuuuuuuuuuuuuuude!!!!!!!! SO ecstatic for you!!!!!!! It's a girl. That is all. Oh aaaaaannd I love you and I'm so happy for you and I can't wait to see you! CONGRATS!!! I have been saying that you would be soon :) CONGRATS!!! I'm one who announces before the pee stick is completely dry! I'm glad you did too; I won't have an accident cover blow now. 4 out of 5 of our dinner attendees next week will be packin' a baby (or 2). Omg! What if it's twins?! Don't say 'no way'. Lightening already struck our circle twice. It can a third! :) January baby, right? Yes, I will NOT be making an announcement at our dinner party Monday night. I will be the only drunk one there....thanks ladies. It's all good. I got this one. That pic is SO STINKIN CUTE! A(nother?) geek baby! I'm pumped for you guys. Even if you DID have a chance to tell me IfreakinRL, but whatevs. Hooray! Congratulations! Can't wait to meet the second little guy. Thanks for the comment regarding my big news- it appears you have some even bigger news though! Congratulations!! Hope you are feeling well! Congratulations from both Serenity and I! That's fantastic news!